6th December, 2018, New Delhi: The Government has recently announced that it will pay 50% of the salary of the 14 weeks of extended maternity benefit to women. The Maternity benefit Act had increased the maternity leaves for women in India from the earlier 12 weeks to 26 weeks. The news had spread a cheer among the females as they will be able to stay closer to their babies for a longer period of time, while it spread panic among SMEs and startups as it would mean an extra financial burden on their already tight financial condition. 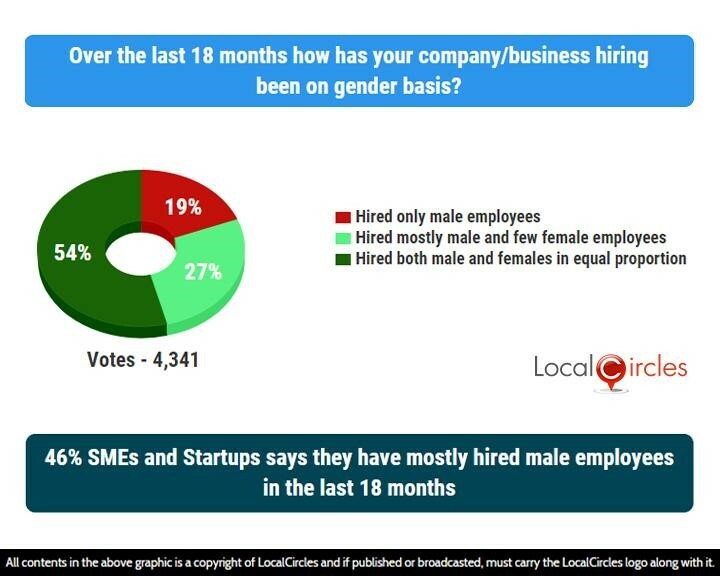 LocalCircles conducted a large survey among SMEs, startups and entrepreneurs to get a pulse on what effect this change has brought to their usual working and hiring process. The survey received more than 15,000 votes from 8,000+ Startups and SMEs located all across India. 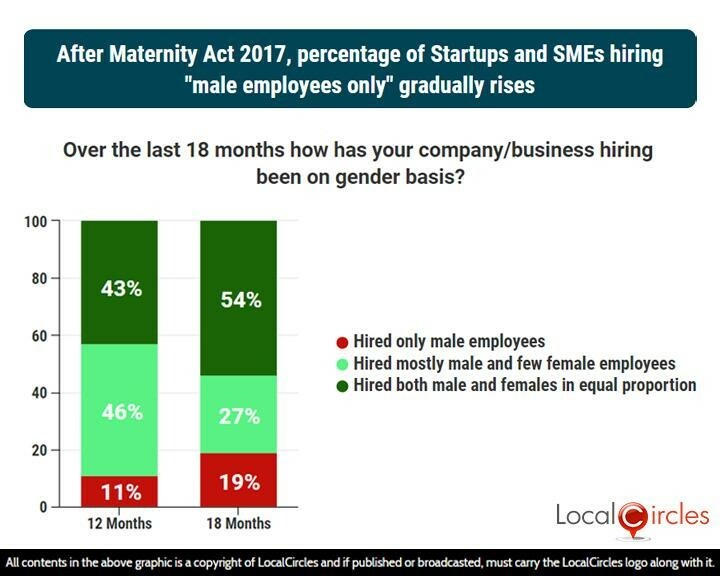 The first question asked over the last 18 months how their company/business hiring has been on gender basis after the maternity law came in effect. 19% said they hired only male employees while 27% said they hired mostly male and few female employees. 54% hired both male and females in equal proportion. 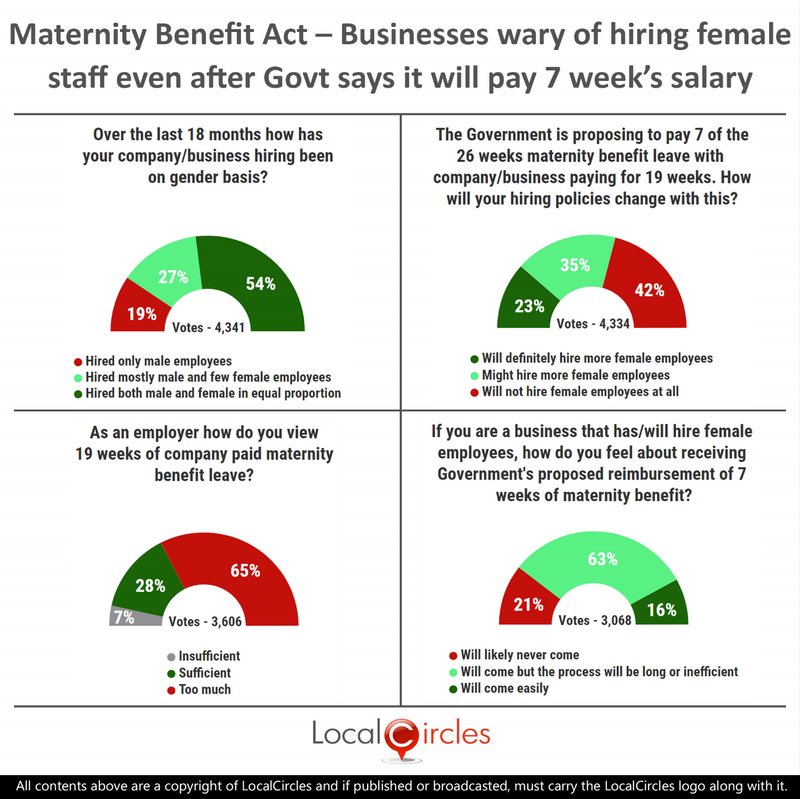 A LocalCircles survey done last year had predicted that the Government ruling of extending maternity leaves for women will have a negative impact on their hiring, especially by startups and SMEs as they will not be able to bear the extra financial stress. The comparison of the 12-month and 18-month poll shows that the companies who have hired only male employees, has risen from 11% to 19% in the last 6 months. 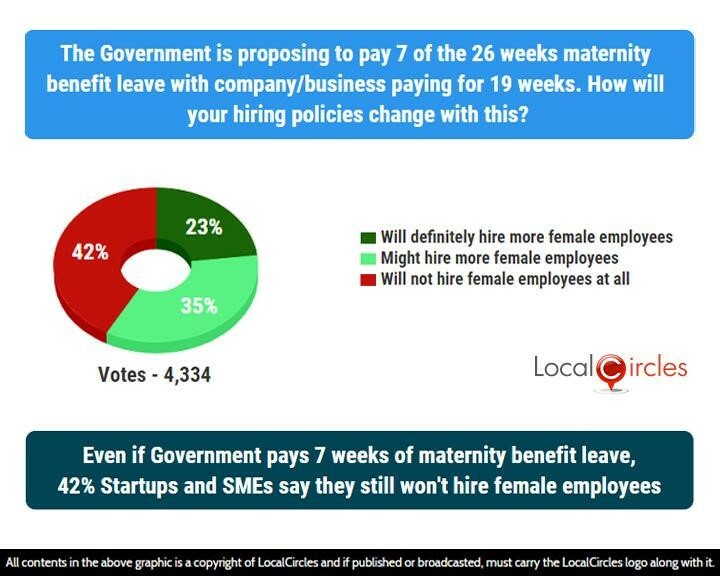 The Government is proposing to pay 7 of the 26 weeks maternity benefit leave with the company/business paying for the rest 19 weeks to reduce the burden for Startups and SMEs. The next question asked startups and SMEs how their hiring policies will change with this. 23% said they will definitely hire more female employees and 35% said they ‘might’ hire more female employees. 42% said they will not hire female employees at all. The Ministry of Women & Child Development had received many complaints saying that corporates were hesitating in hiring female employees after the extension of the leaves. This was followed by WCD minister Maneka Gandhi meeting the Labour Ministry and both jointly deciding towards reimbursement of maternity leaves for 7 weeks. 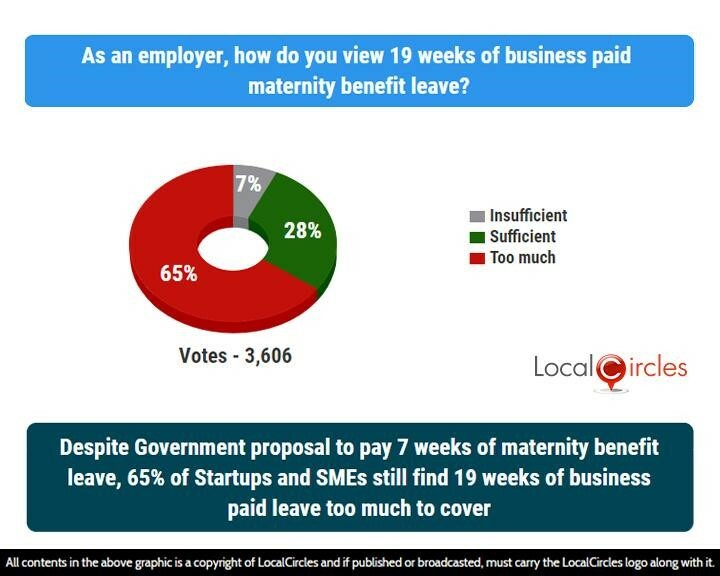 The next poll asked the 8000+ startups and SMEs as an employer, how do they view the 19 weeks of business paid maternity benefit leave. 65% said it is too much while 28% said it is sufficient. 7% felt it was insufficient. 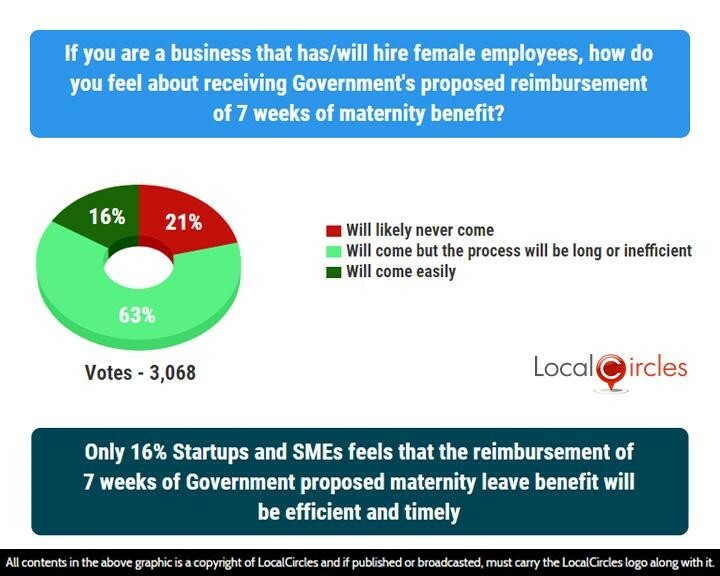 The last question asked SMEs, startups and entrepreneurs that if they have recently hired or are planning to hire female employees, how do they feel about receiving Government’s proposed reimbursement of 7 weeks of maternity benefits. 63% said that the reimbursement will come but the process will be long or inefficient. 21% said reimbursement will never come while only 16% said it will come easily. The scheme will be applicable for women who earn at least Rs. 15,000 a month. Although it is a forward-looking move by the Government, the business community fears that its implementation might take a while and foresee many hiccups in the reimbursement finally reflecting in their bank accounts. Till then we can just hope that this move will reduce the hiring bias from the corporate mindset. In discussions on LocalCircles in 2017, majority of the startups and SMEs seemed supportive of 2 months of paid maternity benefit leave and unpaid leave of up to 4 months. 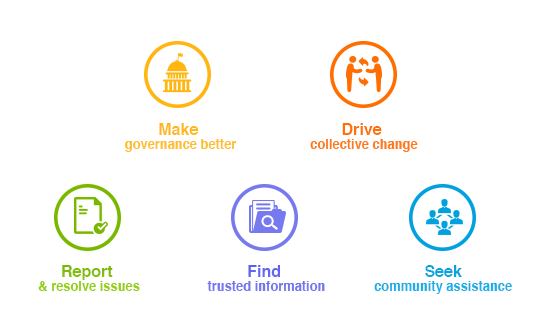 LocalCircles will be submitting the findings of this report to the relevant Government stakeholders for their consideration. The survey was conducted in the Startup/Doing Business circle on LocalCircles and more than 35,000 startups and SMEs are a part of it. The survey received more than 15,000 votes from 8,000+ Startups and SMEs located all across India.